Publisher: Withers Publishing, Halifax, Pennsylvania, U.S.A. 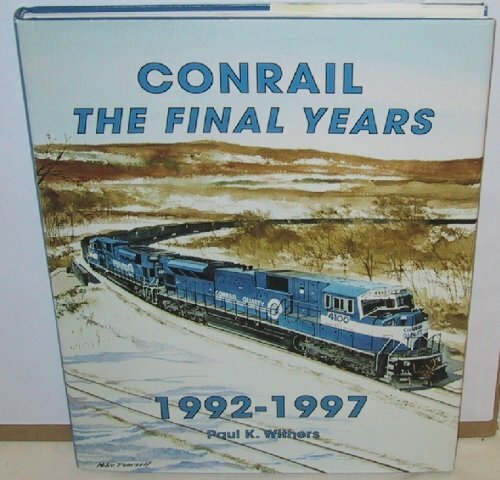 Written in the final months of Conrail's independence, this book picks up where "Conrail/Motive Power 1985-1991" ended. The carriers diverse fleet of GM and GE locomotives is pictured in both action and roster format. A special section is devoted to in-depth coverage of Conrail's SD80MAC model. With more than 500 black and white and some color photos. The cover features a specially commissioned painting by noted railroad artist Mike Pearsail. Includes complete roster information for all locomotives used between 1982 and 1997.